The deployment and configuration pieces will be covered in parts 9 and 10. As such, I assume that at the very least you’ve deployed a 3 node Hyper-V cluster on Server 2016 and it’s managed by the latest version of SCVMM. The Network Controller communicates with network devices, services and components using its southbound API, the northbound API is used to allow administrators to configure, monitor, troubleshoot and deploy services, via, PowerShell or SCVMM for example. The Northbound API is implemented as a REST interface. SDN on Server 2012 used Network Virtualisation Generic Routing (NVGRE is an extension of GRE) as its only encapsulation method, in Server 2016 it uses both GRE and Virtual Extensible Local Area Network (VXLAN), with VXLAN being the default. GRE is one of the options available for tunnelling out of the RAS Gateway (a little more on that later). 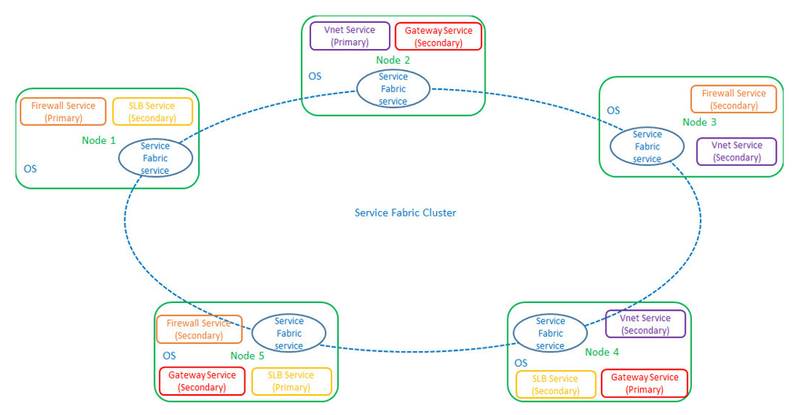 Being that we’re deploying our Network Controller role as highly available, it’s worth noting that this isn’t done by means of failover clustering and instead uses Service Fabric. The Network Controller can be deployed as a single node for testing scenarios but for the purposes of this guide, we’ll be deploying the 3 node production option by means of an SCVMM Service template. Our Network Controller deployment will therefore be a service fabric application made up of several stateful services, spread across one primary node and two secondary nodes. It’s also worth noting that the primary node (replica) services all requests (for the services that are primary to it) with the two secondary nodes existing for high availability purposes only. So workload load balancing is achieved because not all primary service replicas will exist on the same node…does that make sense? No? OK, hopefully it’s just down to my poor explanation, so here’s a diagram to try and help clear things up. Very fast failover due to multiple hot secondary service replicas being available at all times. Easy to scale up and down as required. Persistent storage by means of a Key-Value store that is replicated and transactional. Service modularity. Each service can be developed and updated without affecting the others. So among other things, this means that not only is SLB responsible for load balancing our inbound tenant traffic, it’s also responsible for providing the inbound and outbound NAT for our tenant SDN VM networks. So how exactly does the SLB role work then? It works by mapping virtual IP addresses (VIPs) to dynamic IP addresses (DIPs), but what the hell are VIPs and DIPs? Firstly, where SLB is concerned, there is a public VIP and a private VIP, NAT’d together. These are single IP addresses that sit at the front of your VM network and provide public access to a group of VMs attached to said VM network. These VIPs are held within the SLB Multiplexer and are advertised out to the physical network as a /32 route using Border Gateway Protocol (BGP). DIPs are the IP addresses assigned to member VMs within a SDN VM Network. So with all that in mind, here’s a quick diagram of a packets travels from the internet to a VM on a SDN VM Network. The RAS Gateway is a role you may or may not need to deploy, depending on the requirements of your SDN scenario. This guide will be skipping the deployment of the RAS service as I’ve not had the chance to get much hands-on experience with it and I didn’t want to delay the guide until that changes. I will however add a separate guide on it when I get time over the next couple of months…or so. I won’t go into too much detail here as I’m sure you all know what a site-to-site VPN is It’s the ability to connect two networks in two difference physical locations across the internet over a Virtual Private Network…there, done. BGP is a dynamic protocol, when tenants or organisations have multiple sites that are connected using BPG enabled routers (or RAS in this case), BGP allows routes to be automatically calculated. This also has the added benefit of cutting down on the need for manual route configuration by admins. 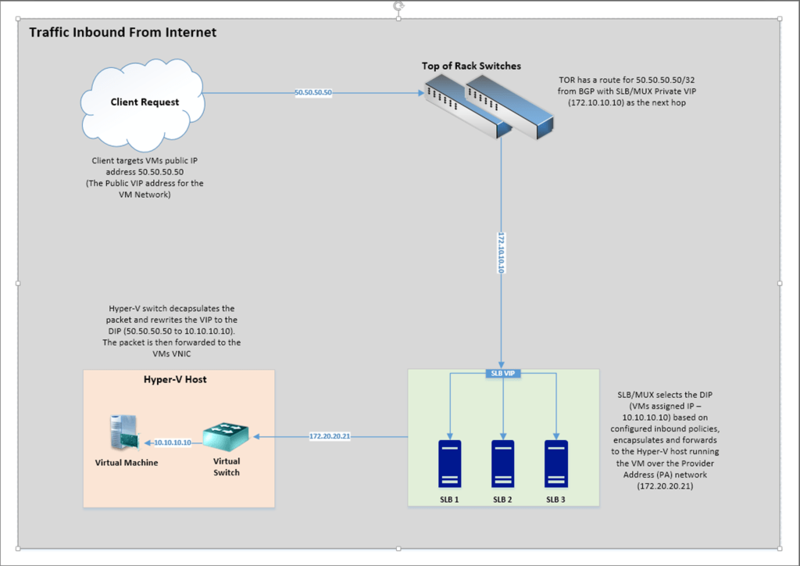 *1 – Set native VLAN on TOR ports, set as 0 within OS/SCVMM logical networking. NOTE: The above VIP networks have NA against their VLAN ID because those subnets are reached via BGP advertised routes to the SLB/MUXes and gateways, there are not configured on any interface on the physical switches. It will also be the network used to reach your configured DNS servers. This network carries the encapsulated virtual network traffic. This network is used for exchanging BGP peering information and external/internal tenant traffic (North/South). The Hyper-V hosts that run SLB or RAS VMs need connectivity to this subnet. This network will contain the public IP addresses that will internet routable. These will be the front-end IPs used by external clients to connect to tenant workloads running on SDN virtual networks. This network does not need to be routable outside of the cloud as it is used for VIPs that are only accessed from internal cloud clients, such as the SLB manager or private services. The GRE VIP network is a subnet that exists solely for defining VIPs that are assigned to gateway virtual machines running on your SDN fabric for a S2S GRE connection type. This network does not need to be pre-configured in your physical switches or router and need not have a VLAN assigned. If this network is RDMA capable, it should be tagged with a VLAN as this is a requirement of most physical switches to allow them to apply Quality of Service (QoS) settings correctly. Now that we know what each of the networks are and what they do, let’s have a look at what’s required in your routing infrastructure. The VIP subnets we covered above do not have a VLAN assigned and are not pre-configured in the Top of Rack switches. The next hop for these subnets is advertised by the SLB/MUX and RAS Gateways to the Top of Rack switches using internal BGP peering. You will need to create a BGP peering on your Top of Rack switches that will be used to receive routes for our VIP logical networks advertised by our SLB/MUXes and RAS gateways. NOTE: This peering should only be one way from the SLB/MUXes and RAS gateways to the Top of Rack switches. Once your SLB/MUXes (and RAS gateways if required in your scenario) are deployed, your network team will have to configure your Top of Rack switches to accept connections from the ASN and the Transit logical network they’re using. Configure TCP State Bypass – This is required due to “u-turning” as traffic is entering and leaving the firewall via the same interface but with a different destination. (config-cmap)#description "SLB/MUX TCP traffic that bypasses stateful firewall"
Disable TCP randomisation – As above, the return path to the SLB/MUX VIP address doesn’t go back through the firewall, therefore it’s sequence number can’t restored after being randomised on the way in. This can be disabled for the VIP address only and doesn’t need to be a global change. On the Top of Rack switch ports your Hyper-V hosts are plugged into, change the MTU to 1702 to accommodate the Encapsulation overhead of SDN. If your Physical NICs support the EncapOverhead property, a value of 160 will be applied to them during the deployment of the SDN roles., otherwise you’ll need to modify the NIC settings yourself. Microsoft have a massive amount of documentation now available on SDN that wasn’t there when I was building this out the first couple of times. What I’m hoping to do is give you everything you need to get started without it being too overwhelming (as it was for me). 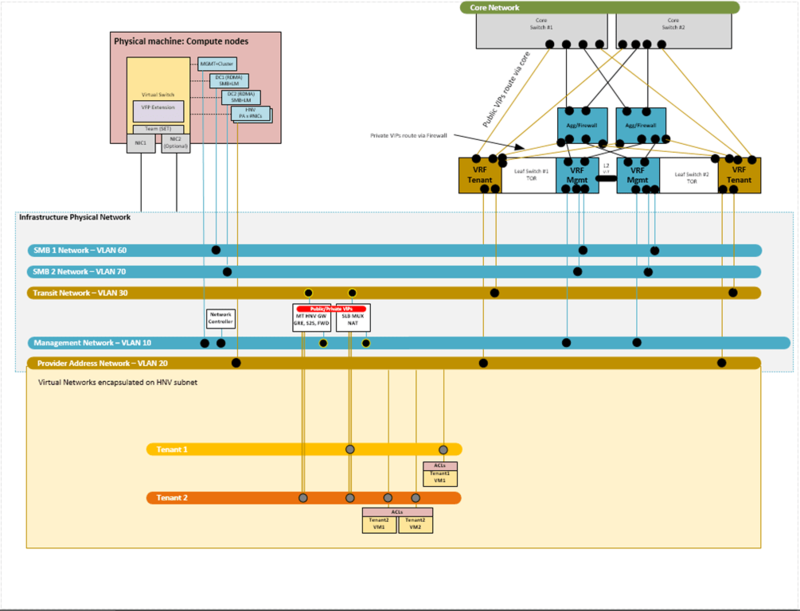 Before we finish up, here is a diagram that was put together during our lab build out to try and illustrate how all this is connected up. Phew, so now that we’ve gotten that out of the way, I’ll see you in Part 9 when we actually deploy this to our infrastructure. My sNAT config seems wrong… My firewall – BGP – router – TOR admin told me that he sees traffic originating from on of the HNV network ip addresses. 1. Ask your network admin to check that he/she can see a successful BGP session coming in from the SLB/MUX VMs on the transit network, if so, what routes are being shared, you should see IPs from the Private VIP network if you’ve enabled a tenant VM for outbound access. 2. What’s the output of running debug-networkcontrollerconfigurationstate -networkcontroller , is everything showing as healthy? 3. Have your network admins had a look at whether 3-way handshake and/or disabling sequence randomisation are required in your setup? There is a diagram at the bottom of this post that should show the traffic flow. Hopefully that’ll help get things moving again, unfortunately I no longer have access to the kit I require to keep a lab up and running so most of this is from memory. After your suggestions we narrowed down the issue to the BGP router. Well the routing guys figured it out. Since the packages go around through many VLANs there were some unusual requirements in the BGP router that the SLBs talk to. After sorting it out there seems to be good functionality besides the fact that ICMP does not get NATed outside! HTTP out, RDP in, all works fine. Any ideas why I don’t see ping getting NATed out? Really happy you’re all up and running. Regarding the ICMP issue, I could be remembering incorrectly here as it’s been a while, but I don’t think ICMP will/can route over the SDN network, much in the same way that it doesn’t in Azure. Happy to be corrected on this though, as I said, it’s been a while. Thank you for the great guides about SDN that were very helpful for me. It’s been a while I’ve been trying to implement a LAB environment based on VMM with SDN of Microsoft. However, I’m stuck on some communication issues. 1. NC leaves error messages in event log every 5 minutes. They report that NC can’t connect to some devices specified with IDs. I found that these IDs belong to hosts. 2. Netstat check on port 6640 reports that every host or NC itself listens on the port but no connection have been established. 3. Every next check like Get-ProviderAddress, Get-PACAMapping is without any result obviously because of the previously mentioned problems. 1. Whole network is capable to transmit packets greater than 1674 – checked with ping between almost every devices. 2. All related services and components both on NC or hosts runs. 3. I think that almost all diagnostics of NC via Powershell are ok.
4. I’ve also upgraded every OS, firmware and drivers. Can you give me some advice what could be wrong, please? I’m glad the guides helped. It’s been a good while since I worked on SDN so I’m a little rusty and I’d imagine the process has changed a little since then. It sounds like there’s an issue with the Provider address network, I assume you’ve created all that within VMM?